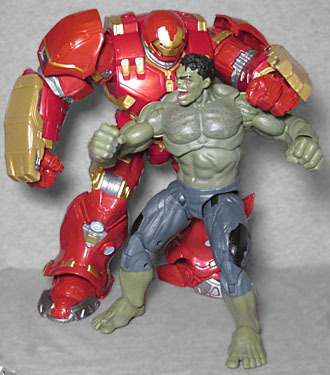 When Bruce Banner becomes the smashing, crashing Hulk, Tony Stark calls in the Hulkbuster armor to challenge Banner's alter ego and save the city from total rage-fueled destruction. 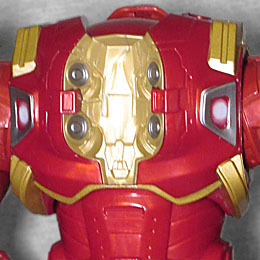 Observation: the Marvel Studios: The First 10 Years line features more Iron Man than any other character. Ten sets, and five of them have a Tony Stark. One of them even has two! It's clear whose back the MCU is built on. Despite efforts to stay grounded, Bruce Banner falls captive to the mind games of Scarlet Witch and loses his temper, swirling into a blind, catastrophic rage. 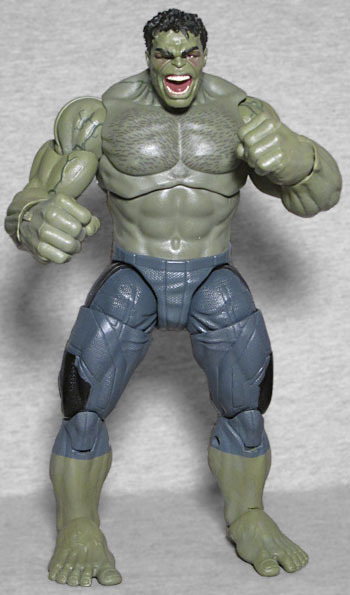 It should come as no surprise that this Hulk is a repaint of the Avengers: First Blood Part II Hulk figure - you remember, the one with the smooth chest and the techno-pants? Yeah, that. You'll recall that was a decent figure, not overly impressive or anything, but not awful. This toy is mostly just a repaint of that one, but that's to its advantage: his rubber capris are the proper color now, a light bluish grey with some darker patches on the outside of each leg. That actually works out for the better, because the hip joints (which still stick out farther than the plastic surrounding them) are the darker shade, and thus have a reason for not lining up perfectly. More importantly, though, is that instead of bright green, his skin is the greyish tint it turned when Wanda whammied him. There are dark veins on his arms, shoulders, neck and face, and they even tampoed his chest hair this time! The reddish tint is present around his eyes, and the whole head is a new mold: the other figure had his teeth gritted, while this one has his mouth open in a full bellow. Extra angry! 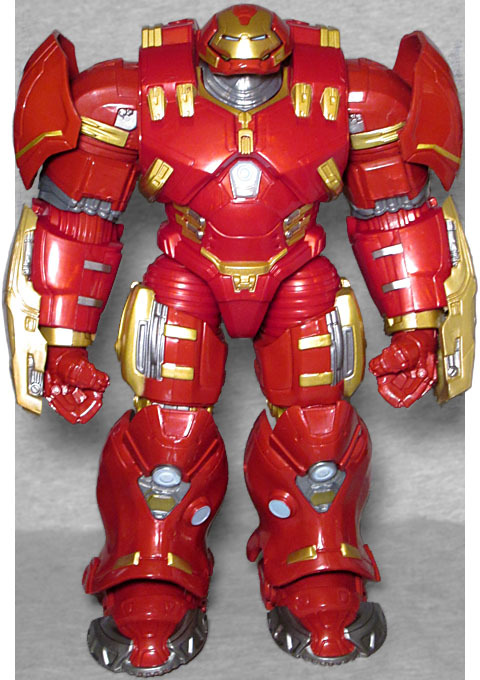 Having anticipated the need for backup in situations involving the gamma-green goliath, Tony Stark creates Veronica - a titan-sized suit of armor known more commonly as the "Hulkbuster." Boy, this set and its repaints, am I right? 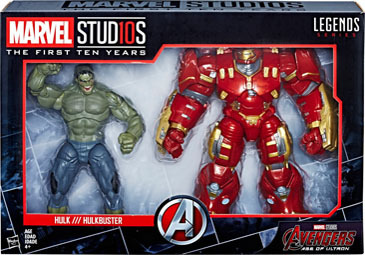 At least Hulk got a new head - this is just the Avengers 2: Stardust Memory BAF with a better paintjob. Not this good, but definitely better than before. The red is darker, making it a closer match to the Mark 43, and there are more apps overall; lots of small things that add up to a big improvement. It's not perfect - there are still places where apps have clearly been skipped, especially on the back of the figure - but it's a definite improvement. One thing that would have been cool? If they'd designed him a new left forearm, to include the "capture ring" Tony used to latch onto Hulk's fist and try to drag him away from the city. That would have added even more value than the paint apps already do. This oversized two-pack is really just a set of glorified repaints, but both of them are better than the versions we already had.